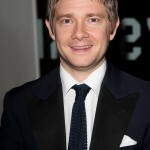 Martin Freeman is no stranger to audiences, but the level of fame that will come with his role as Bilbo in a Tolkien franchise film will exceed anything he’s yet to experience. Just ask the Orlando Bloom. In a taping earlier today of the “Graham Norton Show,” which airs tonight in the UK and tomorrow night in the US, Freeman has several things to say about the attention “The Hobbit” will bring him.